Canned goods can sometimes be a problem especially if a recipe only calls for the partial use of them. I don't know how many times my frugal nature has lead me to save a partial can of something with no real idea about what to do with it. On the other hand if necessity truly is the mother of invention, many new recipes have probably evolved because of the need to use up something. This is what I faced when I realized that the recipe for Kiwi Smoothie, (post #204), only called for the use of part of a can of coconut milk…not a regular ingredient on my shopping list. None of my collection of recipes called for coconut milk; I could have just poured the remaining milk down the drain and been happy with the 'out-of-sight, out-of-mind' way of thinking, but my nature to save...would not let me do that. My new goal was to figure out how to simply and easily use the rest of that can of coconut milk. I came up with a great pancake recipe that is not only easy to make…it made a December breakfast seem tropical and lovely. I like my pancakes to be almost as thin as crepes...the ratio of liquid to pancake mix, obviously dictates that feature. Because Krusteaz has dried milk already in the mix, all I needed to do was to add more water to create the thin, delicate pancakes that I enjoy. Mix above ingredients to just blend. Batter will be slightly lumpy. Spoon desired amount of batter onto a hot, greased griddle. Cook until bottom is golden and top is set. Flip pancake and cook second side until it is evenly browned. Remove to a warm platter and continue making pancakes with remaining batter. 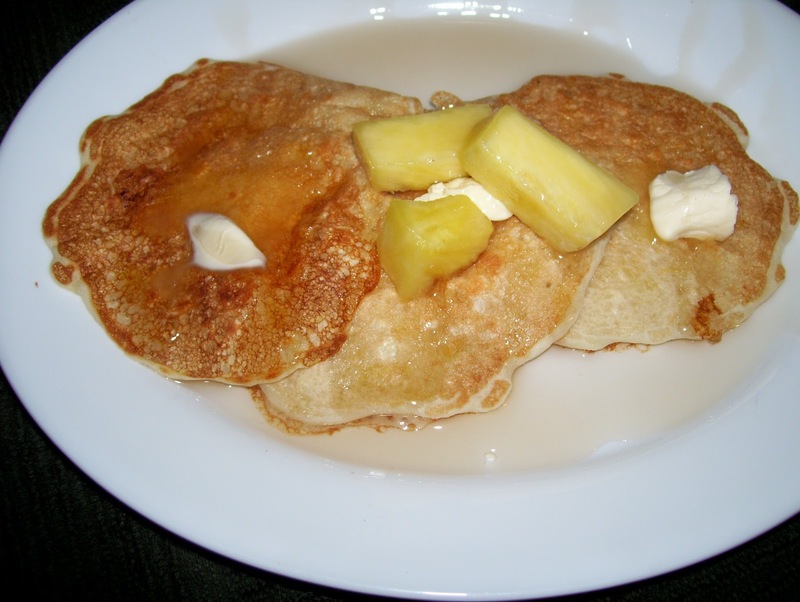 Top with more pineapple, butter and syrup. I think this looks great. I just need to convince Holly to make it for me. What do we do when there is no Krusteaz pancake mix?